Hello, fellow EDH players! My name is Warren Daniels, and my life revolves mostly around two things: data and Magic. By day, I work as a consultant, specializing in economic, financial, and statistical matters. After work, you can find me at a nearby local game store (LGS), the bar, or over at a friend’s house playing EDH. Now, thanks to EDHREC, I finally have an opportunity to combine both of these aspects in a new series, By the Numbers. I’m writing this series because I believe that data can help us make better decisions. (You probably believe that, too, which is why you’re on EDHREC!) In this series, we’ll dig deep into the data on the EDHREC website to better understand the choices that EDH deckbuilders make. I say “we” because the data on EDHREC — and, by extension, this series — wouldn’t be possible with you and your decklist contributions. 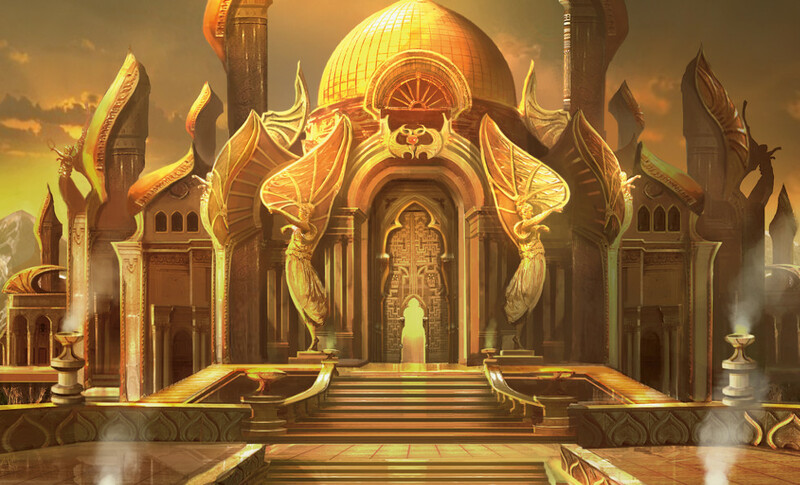 Without further ado, let’s kick off the series with a simple question: Why don’t more players run City of Brass and Mana Confluence in their decks? City of Brass and Mana Confluence (5c pain lands) are two of the strongest lands available for multicolored decks. Operating similarly to Command Tower, the color fixing these cards provide is invaluable and comes at the relatively low cost of losing 1 life every time they’re tapped for mana. In 20 life formats, tapping a bunch of 5c pain lands can quickly bring you down to a dangerously low life total, but the 40 starting life in EDH works twofold in these lands’ favor. First, every tap of a 5c pain land is a smaller percentage of your life total. Second, high starting life totals encourage “big” strategies such as threatening 100 damage in one combat phase, or simultaneously killing everyone at the table with an infinite combo. The focus on these strategies means that each point of life loss matters even less. In fact, the fixing is so important and the life loss is so often irrelevant that many competitive 2-color decks opt to run one or both 5c pain lands, just to have more sources of mana that can tap immediately for any color. Now, it might not be the right call to play 5c pain lands in your own 2-color decks — after all, color fixing isn’t usually a big problem in 2-color decks, unless you’re playing a blazing fast deck with relatively few lands. But the more colors you add to your deck, the more you need good color fixing. The 4-color legendary creatures released in Commander 2016 make great use of the 5c pain lands, and anyone looking to make a consistent land base for these decks, both budget and budgetless players, should put these two lands into their decks, no questions asked. The fact that so many players don’t run these two lands in their 4-color decks is quite perplexing to me. Across the board for each 4-color commander, the much slower tri-color lands (such as Arcane Sanctum and Nomad Outpost) take precedence over 5c pain lands. Budget considerations may explain some of why players do that, but it’s not the whole story. Consider, for example, that all available shock lands for each 4-color commander are more popular than both City of Brass and Mana Confluence. They forgot to add these lands, or don’t know these lands exist. This one is hard to test conclusively, but we can test this hypothesis by graphing the likelihood of playing 5c pain lands as a function of how many cards differ from the C16 decklists, under the assumption that people upgrading their preconstructed decks may not be upgrading all the cards they should be. This is the “Precon Effect,” as observed by Sam Alpert here. These lands are out of their budgets. We will test this by graphing the likelihood of playing 5c pain lands as a function of decklist budgets, using price data from MTGPrice.com. Life totals matter more in their metas because their playgroups strongly discourage “life totals don’t matter” win conditions such as mill, voltron, infect, and/or combo. One way we can test this is to stratify decks by whether they contain known “degenerate” strategies that don’t care about life totals to win. For example, Nim Deathmantle and Ashnod’s Altar can go infinite in Breya, Etherium Shaper. Tezzeret the Seeker and The Chain Veil is a common way to go infinite in a superfriends deck such as Atraxa, Praetors’ Voice. Infect cards in Atraxa are also considered degenerate for the purposes of this analysis. If decks contain these so-called degenerate strategies, we can reasonably assume that the playgroup that these decks operate in groups that care less about life totals. The wonderful people of EDHREC gave me deck list data for all five 4-color commanders as of early January 2017: Breya, Etherium Shaper, Yidris, Maelstrom Wielder, Saskia the Unyielding, Kynaios and Tiro of Meletis, and Atraxa, Praetors’ Voice. There are 4,641 total decks in this analysis. These deck lists all come from TappedOut.net, as is the case for all decks on EDHREC. All price data from MTGPrice.com. All regressions henceforth will refer to probit regressions, which are utilized to calculate the probability of a binary event given some independent variable(s). A deck list either has 5c pain lands or it doesn’t have them—this binary event is the dependent variable in each part of the analysis. Now, let’s begin testing our hypotheses! 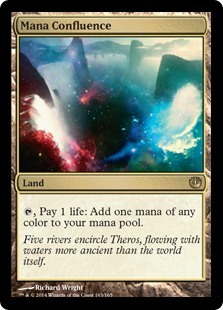 Hypothesis #1: They forgot to add these lands. Forgetting to add key cards happens more than you’d think. 6.3% of the 4-color commanders in the data used are missing Command Tower, the indisputably best land you can run in a 4-color commander deck that also comes with every single C14 precon. 13.3% of the 4-color commander decks are missing Sol Ring; there are some very, very niche scenarios where that might be the right call such as house rules banning Sol Ring, but the number is probably closer to 1%, not 13.3% of decks. In total, 17.3% of the 4-color commander decks on EDHREC are missing at least one of those two cards. So how many cards do people tend to switch out of the preconstructed decks? Let’s see for ourselves! The median deck has 28 cards overlapping with its respective precon. 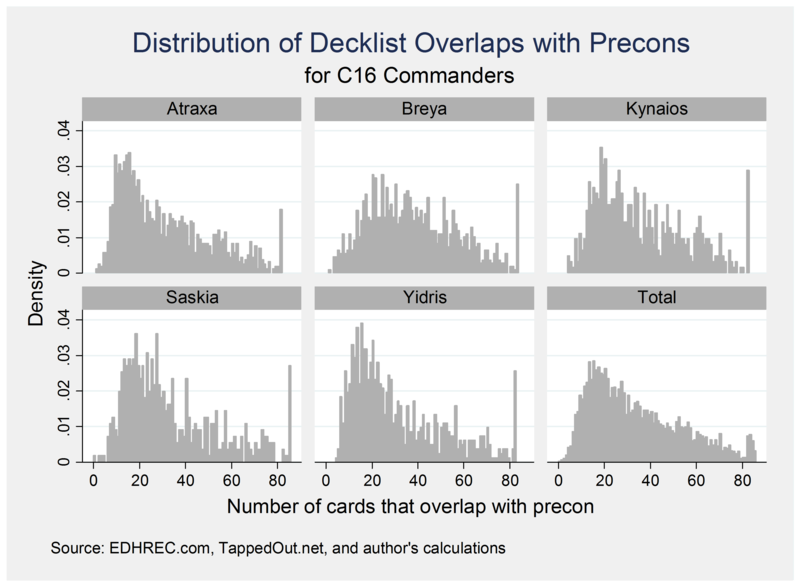 It’s worth noting that the precons have anywhere from 16 to 21 basic lands, and the analysis treats all basics (regardless of quantity) as being a card in the precon; this means that the C16 commander decks cap out at 78-83 cards overlapping in the 99. Overall, it would appear TappedOut.net users make a lot of changes to the precons, only leaving a handful of cards in. So how many of those changes include City of Brass and Mana Confluence? And how far into the modding process do people add those cards in? 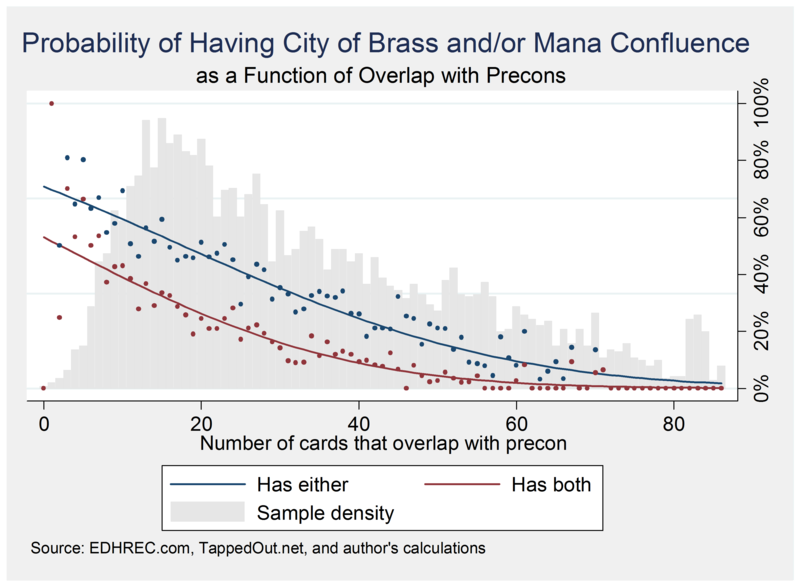 According to our probit regression, the probability of having either City of Brass or Mana Confluence crosses 50% between 17-18 cards overlapping with the preconstructed decks. 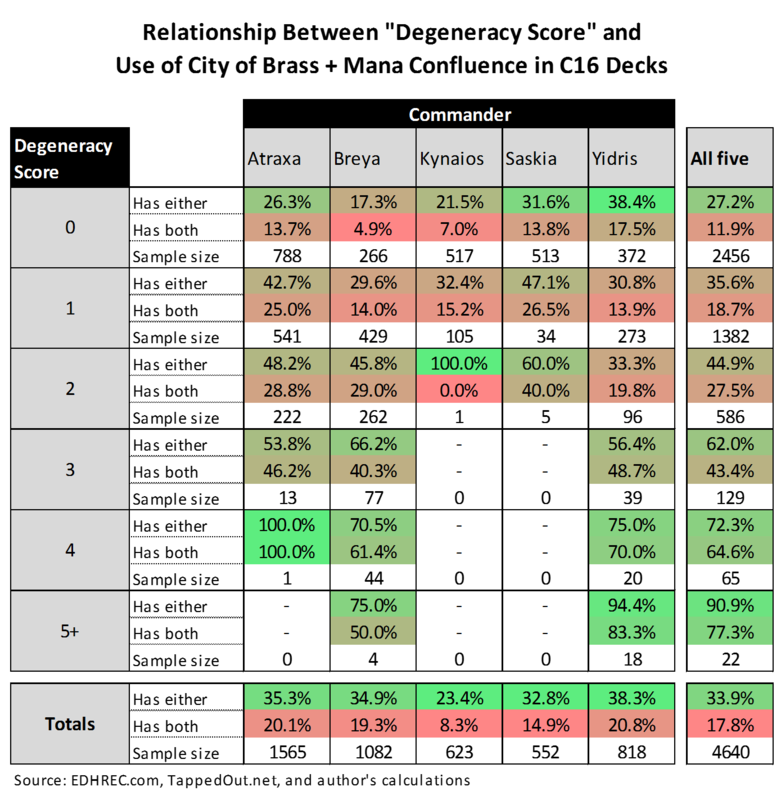 The probability of having both City of Brass and Mana Confluence crosses 50% between 2-3 cards overlapping. Because the overlap includes basic lands, it essentially means that people are only more likely than not to run both if they’re literally running 2 or fewer basic lands! Overall, I don’t find this to be a satisfactory explanation. It seems like people are making a conscious decision to not run 5c pain lands. But why? Hypothesis #2: These lands are out of their budgets. 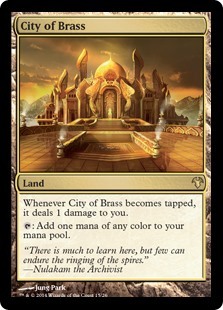 Mana Confluence and City of Brass are relatively cheap cards, so I don’t think this a good reason to exclude these lands once you start treading into 3-digit budget territory. But if someone is doing a $30 upgrade to a C16 precon, spending a third of that on two lands might be a tough sell. I don’t think this explains most of why people don’t run these cards, but it might explain some of the reasons why. Below we can see a histogram of deck prices, excluding ultra-expensive decks in order to keep the graphic a little cleaner. The median C16 deck is about $331. Atraxa, Praetors’ Voice has the highest median price at $420 (planeswalkers aren’t cheap! 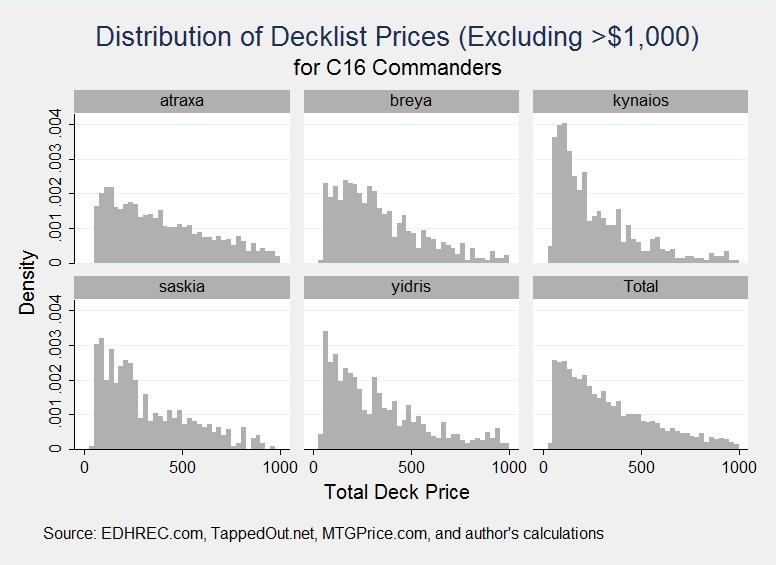 ), while Kynaios and Tiro of Meletis decks have the lowest median at $209. 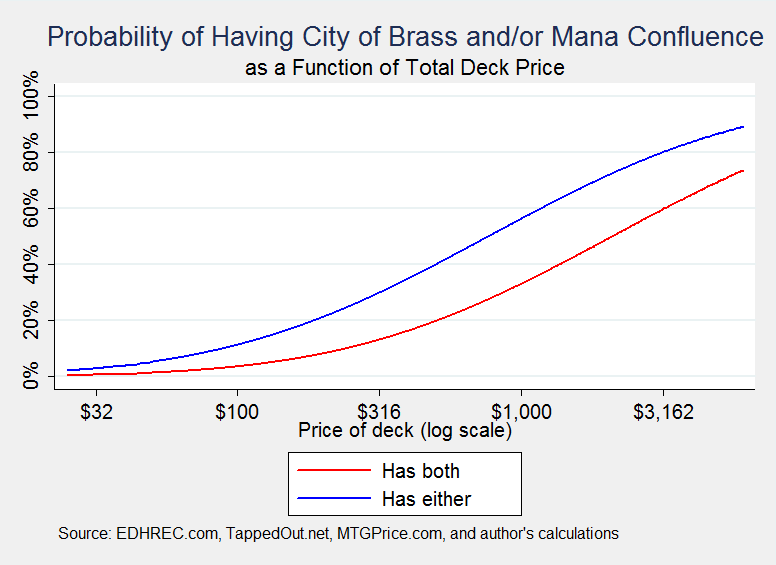 I’m of the opinion that $200-400 is well within a reasonable budget range to start adding in Mana Confluence and City of Brass—but do deckbuilders agree? Let’s see what the regression says, using log price as our independent variable. While there’s a very strong relationship between deck price and 5c pain land usage, it takes players a lot of digging into their bank accounts until they actually put Mana Confluence and City of Brass into their decks. The probability of having at least one 5c pain land doesn’t exceed 50% until about the $766 mark; having both takes over $2,000! While price does seem to have an effect on 5c pain land use, the effect doesn’t seem to correspond with actual budgetary restrictions. People tend to fill their decks with fetch lands and shock lands before they even consider 5c pain lands. So what’s really going on? Well, one indirect reason why budgets might correlate with use of 5c pain lands: higher budget decks are often more efficient, win faster, and therefore care less about life totals. We’ll talk more about this when we test hypothesis #3. Hypothesis #3: Life totals matter more in their metas. 5c pain lands are naturally less appealing in metas where life totals matter. This doesn’t mean you shouldn’t run them, but it’s definitely a legitimate reason to hesitate considering them when building your land base. On the flip side, there’s no reason to hesitate on adding 5c pain lands if your group plays with things like infinite combos and infect. If they’re not going to chip away at your life total to win, then why not use your life total as an expendable resource? For ease of terminology going forward, we’re going to lump these types of strategies together and call them “degenerate” strategies. I use that term endearingly so don’t take it as a slight! I run plenty of these degenerate strategies in my own decks. I also couldn’t think of a better one-word descriptor for strategies that circumvent life totals. We can see if so-called degenerate strategies explain why players don’t run 5c pain lands by giving the decklists in our data a “degeneracy score,” roughly based on the number of degenerate strategies they contain. The point of the so-called degeneracy score is to approximately rank decks by how likely they are playing in a highly competitive meta, or in a meta where life totals do not matter that much, based on either how strong and “un-fun” the cards in the deck are or if they can otherwise win the game easily by circumventing life totals. Basically, more combos = more degenerate. There’s no straightforward way to account for redundancy of combos when giving a score of how degenerate a deck is. For example, including all of Nim Deathmantle, Eldrazi Displacer, Ashnod’s Altar, and Krark-Clan Ironworks in Breya gives you 4 ways to perform what is effectively the same combo. For these situations, the best we can do is a slight adjustment upwards to the score. The score adjustments are included parenthetically next to each combo when the combo is sufficiently redundant. When giving a score of degeneracy, this mostly comes down to my personal judgment. There are obviously many infinite combos that will fly under the radar of my scoring system, but I think the things I chose are pretty representative of how to abuse these commanders. I’ve done the best I can to make sure that the score roughly corresponds with the typical EDH player’s concept of degeneracy. The only category that does not relate to life total circumvention is the fast mana category, including cards like Mana Crypt and Lotus Petal. I included this category because I wanted to make a meaningful distinction between slower decks with an infinite combo thrown in, and fast decks exclusively relying on a speedy infinite combo win. This seemed like the best way to do that without over-complicating things too much. (+1) Doomsday or Laboratory Maniac. (+1) At least four of the following: Mana Crypt, Sol Ring, Mana Vault, Chrome Mox, Mox Diamond, Mox Opal, Lotus Petal. (+1) Worldgorger Dragon with Animate Dead, Dance of the Dead, or Necromancy (counts as +2 if all cards are included). (+1) Nim Deathmantle or Eldrazi Displacer, with Ashnod’s Altar or Krark-Clan Ironworks (counts as +2 if all cards are included). (+1) Isochron Scepter and Dramatic Reversal. (+1) Auriok Salvagers and Lion’s Eye Diamond. (+1) Aetherflux Reservoir or Tendrils of Agony. (+1) At least three of the following: Waste Not, Time Spiral, Wheel of Fortune, Windfall, Wheel of Fate, and/or Timetwister. (counts as +2 if at least four, plus Notion Thief, are included). (+1) At least five cards (excluding Blightsteel Colossus) that have or grant infect. (+1) Tezzeret the Seeker and The Chain Veil. (+1) Doubling Season, with at least two of the following: Tamiyo, the Moon Sage; Tamiyo, Field Researcher; Narset Transcendent; Vraska the Unseen; Jace, Unraveler of Secrets. The table shows a strong relationship between playing 5c pain lands and the degeneracy score: going down the table, the likelihood of playing 5c pain lands increases. The most likely explanation is that if your playgroups discourage degenerate strategies, then life totals matter more. Conversely, if your playgroup lets you run things where you can win on the spot without chipping away at life totals, who needs to preserve life? Our analysis shows that adding some upgrades, money, and degeneracy to your deck dramatically increases the likelihood of players running 5c pain lands. While all the hypotheses were confirmed, I think the degeneracy score makes the most sense and provides the most satisfying explanation for what’s going on. Part of me still believes that, even in a meta without so-called degenerate strategies, it’s worthwhile to trade away some life for fast color fixing. The trade-off isn’t as clear-cut, but in 4-color decks where it can sometimes be hard to come by all the right colors at a reasonable tempo, a little life is a small price to pay for what are essentially two more copies of Command Tower. Which leads me to end with hypothesis #4 on why players avoid City of Brass and Mana Confluence: Players tend to overvalue their life totals. As explained in the introduction, the life loss from 5c pain lands is often irrelevant, and using a tiny bit of your life total as a resource in exchange for impeccable mana fixing is usually a great trade-off in a 4-color deck. It’s most likely the case that a lot of EDH players disagree with me there and think that it’s not a good trade-off. While EDHREC’s database can give us an incredible amount of insight into the minds of EDH players, I’m afraid that hypothesis #4 might be a bit hard to test with decklist data alone. So, EDHREC readers, why do you think players don’t run these lands that much? If you’re a player who doesn’t run these lands in your 4-color decks, what influenced your decision? Do you disagree with me on the usefulness of City of Brass and Mana Confluence? In his professional life, Warren Daniels is a consultant, specializing in big data and finance. When he's not sifting through financial data or running regressions, he's at his LGS locking down multiplayer EDH pods with hatebears.